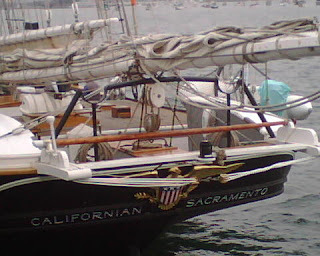 I am declaring annual Maritime Museum of San Diego week on Zephyr (Sail). I never made it to the world famous SDYC but I did spend two hours this afternoon wandering over the five or so classic yachts that comprise the museum...and I'll be writing about them all through the week. First on the list is the (above photo) Californian...built from the ground up in 1984 at Spanish Landing in San Diego Bay. She was launched with great fanfare for the 1984 Summer Olympic Games in Los Angeles. In July 2003, the governor signed a bill into law designating the Californian as the official tall ship of the State of California. She is the only ship to carry this title. Designed for speed, Californian has nine sails, carries 7,000 square feet of canvas, measures 145 feet in length, weighs 130 tons and is armed with four six-pound deck guns. She casts a distinctive and instantly recognizable silhouette and has become one of the most well known tall ships in America.